There are two kinds of hypertension encountered by emergency physicians: hypertensive emergencies, and hypertension. The term hypertensive urgency has minimal meaning, less than minimal utility, and should be abandoned. Patients with a hypertensive emergency are critically ill. They need to be in a resuscitation area on intravenous antihypertensive drips. The hypertensive emergencies are acute pulmonary edema, aortic dissection, preeclampsia, subarachnoid hemorrhage, and hypertensive encephalopathy. Intravenous blood pressure reduction may also be indicated in acute coronary syndrome, acute ischemic stroke, and intracerebral hemorrhage. A patient with severe hypertension and arterial bleeding unable to be staunched using conventional means perhaps qualifies as a hypertensive emergency and it may be reasonable to use IV medications to lower blood pressure in these patients as well; however, if allowed to take its natural course, hypertension in these cases will surely be self-limited. Acute renal failure is always included in the list of hypertensive emergencies, but no one knows what to do with this because while it is clear that longstanding hypertension can box your kidneys, the relationship of the elevated creatinine in the patient in front of you to the hypertension in the patient in front of you is usually impossible to determine. If an acutely ill patient has very high blood pressure and an elevated creatinine that is not known to be old, it is reasonable to treat that patient as a hypertensive emergency. A well patient with hypertension and an elevated creatinine needs to be in an internist’s clinic, not in the emergency department. 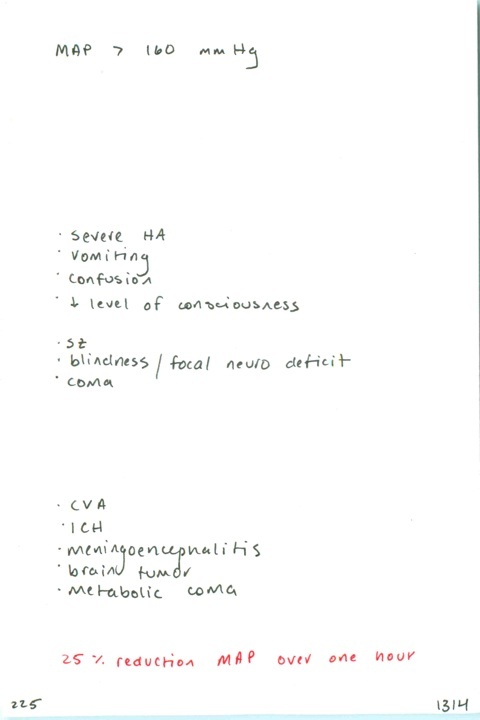 There are a variety of hyperadrenergic states such as cocaine intoxication, thyroid storm, autonomic hyperreflexia and pheochromocytoma that may resemble hypertensive emergency, but it is the hyperadrenergic state that is the therapeutic target in these instances, not the hypertension. Do not forget to actively cool patients hotter than 41°C (105°F). Headache is not a hypertensive emergency, no matter how high the blood pressure. It is likely the headache that is causing the hypertension, not the other way around. Treat the headache and the pressure will come down. The same is true of epistaxis. 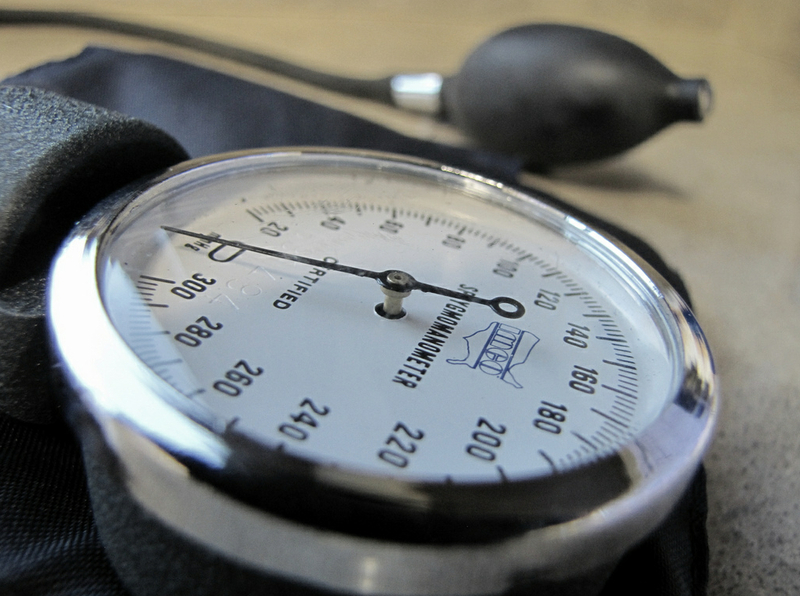 Lowering blood pressure quickly, for example with the infamous IV labetalol push, in a patient who does not have a hypertensive emergency, subjects the patient to risk of harm without chance of benefit. [ref] Many of these patients have been living with high blood pressure for a long time and quick reductions can cause quick problems, like stroke. You can bring the blood pressure down with IV meds, and this may make you feel powerful and may pacify the consultant/nurse/patient/family, but as soon as you turn around the pressure will go right back up. Fixing the number is a great pacifier but is bad for patients. The consultant/nurse/patient/family may not know better, but you are paid well to know better. It’s easier to write for 20 of IV labetalol than to explain to the consultant/nurse/patient/family, but you are paid well to explain. All patients with hypertension, unless clearly secondary to pain or emotion (i.e. hypertension resolves with symptom resolution) should be told that they might have the disease of hypertension and their blood pressure should be rechecked in a primary care physician’s office. How strictly you arrange or recommend followup depends on how high the blood pressure is and how many other diseases the patient has. Shayne & Pitts suggest that patients who have diseases known to be caused by or worsened by hypertension (CAD, CHF, stroke, renal insufficiency, etc) are at higher risk and want to call these patients hypertensive urgency, but this is confusing and unnecessary. Just follow these patients up closely, as is consistent with basic emergency medicine principles. Even if the blood pressure were normal, you would still want these patients to follow up closely because having a lot of bad diseases is a risk factor for a bad outcome. There is no evidence that initiating oral antihypertensive therapy in the ED makes any difference, but it’s not unreasonable and is an excellent patient satisfaction gambit. EMCREG recommends: “Consider oral antihypertensive therapy for patients with blood pressure > 180/110 mm Hg and initiate therapy in patients with blood pressure > 200/130 mm Hg.” I use amlodipine, because it has few contraindications and toxicities. 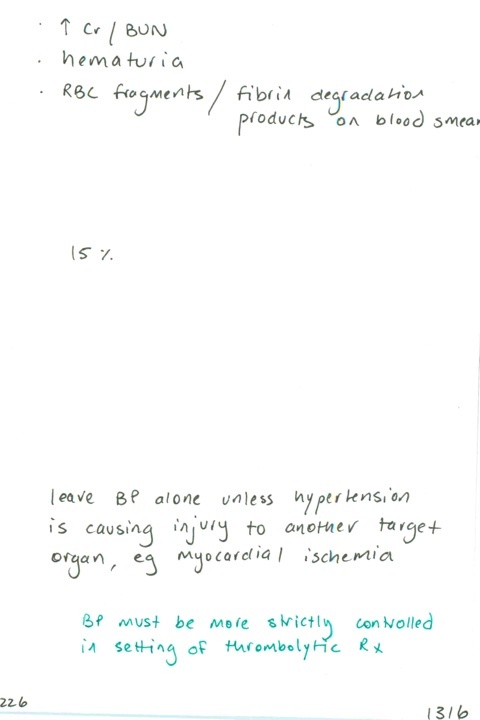 Emergency physicians should not perform ancillary testing on patients with hypertension either to make sure this isn’t a hypertensive urgency, which is a disease that does not exist, or to attempt to tailor a daily antihypertensive prescription to the creatinine, or ECG, or urinalysis, or anything else. You do gunshot wounds and heart attacks and IV dilaudid seekers, let the primary care physician do hypertension. The most common scenario where lowering blood pressure quickly makes a big difference is in acute hypertensive pulmonary edema; in this scenario it’s the blood pressure that’s the problem. The treatment is high dose nitroglycerine and noninvasive ventilation. For very distressed patients with very high blood pressure, start with a 1 mg IV push of nitroglycerine and start your drip at 200 mcg/min and stand at the bedside, watching closely, titrating the drip and giving additional boluses as needed. [ref 1, ref 2, ref 3] Patients with active myocardial ischemia and hypertension should also be on a nitro drip, titrated to relief of pain or untoward drop in blood pressure. Not patients with a positive troponin who are legs crossed reading a newspaper, not patients with undifferentiated chest pain waiting on their second enzyme, this applies to patients who are clutching their chest because their heart wants more oxygen than their coronary arteries can deliver. Preeclampsia is an important hypertensive emergency that is easy to overlook, especially postpartum–almost always within two weeks but possibly up to six weeks after delivery. Hypertensive pregnant or postpartum patients with signs of preeclampsia should be treated with high-dose magnesium (start with 6 g over 20 minutes). EMCREG recommends keeping blood pressure under 160/110 in the antepartum and intrapartum period and less than 150/100 if postpartum or if platelet count is < 100,000. Magnesium will have a salutary effect on blood pressure but if not at target, labetalol is the recommended agent. Other beta blockers and ACE inhibitors should be avoided in pregnancy. Delivery is the therapy of interest in most of these patients, they are therefore usually best managed on L&D. Blood pressure management is key in subarachnoid hemorrhage, analogous to aortic dissection. Use nicardipine to keep SBP less than 160. [ref] Nimodipine, given orally, is to prevent vasospasm later on, not to lower blood pressure. There’s a lot to think about in SAH, so get some help, even if it comes from a dubious source. Hypertensive encephalopathy is not headache, patients with hypertensive encephalopathy are encephalopathic and acutely ill. You are not going to diagnose hypertensive encephalopathy until after you’ve ruled out intracranial hemorrhage, because when a patient presents altered and looking bad with a very high blood pressure, it’s much more likely to be ICH, so that patient needs management of ABC’s and then a quick CT scan. If the CT scan is negative, and the patient continues to be altered and very hypertensive, start your nicardipine drip. If the patient’s mentation improves with lowering of blood pressure, you then say, aha, that was hypertensive encephalopathy. Acute ischemic stroke and spontaneous intracranial hemorrhage patients often have very high blood pressure and medical science has not yet determined if patients with these conditions benefit from blood pressure reduction. 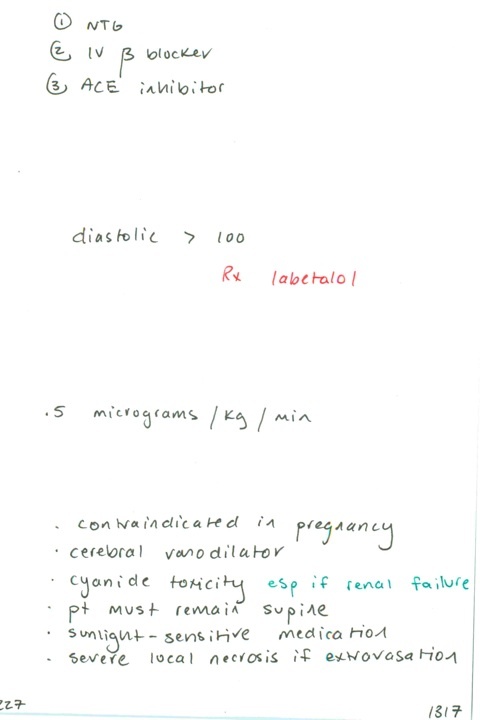 For ischemic stroke, If you’re using thrombolytics, keep blood pressure under 180/105 using nicardipine or labetalol. Otherwise, the latest recommendations are to lower blood pressure above 220/120 by 15% within 24 hours. The AHA says it’s probably safe to lower systolic blood pressure to 140 in ICH patients. Otherwise they suggest blood pressure management according to this table, which isn’t confusing at all. In traumatic brain injury, leave hypertension alone; focus on preventing hypotension and teaching your consultants that ketamine does not raise ICP and is an appropriate RSI agent in this context. Lastly, tell your patients who check their blood pressure at home and then come in for hypertension that checking blood pressure at home causes cancer. All BP values are linked with or as in SBP of 220 or a DBP of 120. Administering antihypertensive therapy in the ED for the purpose of acutely lowering blood pressure in patients without end-organ damage is discouraged. Commence oral antihypertensive therapy if BP > 200/120. Consider commencing oral therapy if BP > 180/110. A basic metabolic panel is recommended before starting a patient on antihypertensives. Avoid ACE inhibitors in woman of childbearing potential. All hypertensive patients require follow-up. 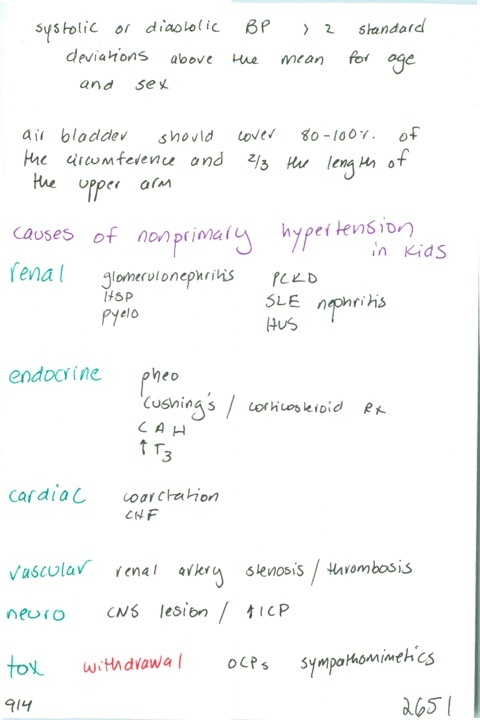 Unless concomitant condition requiring BP control, do not treat until over 220/120. Keep above 140/90. Use labetalol or nicardipine. If signs of high ICP, keep MAP below 130 or SBP below 180. If no signs of high ICP, keep MAP below 110 or SBP below 160. Use labetalol, nicardipine, or esmolol. 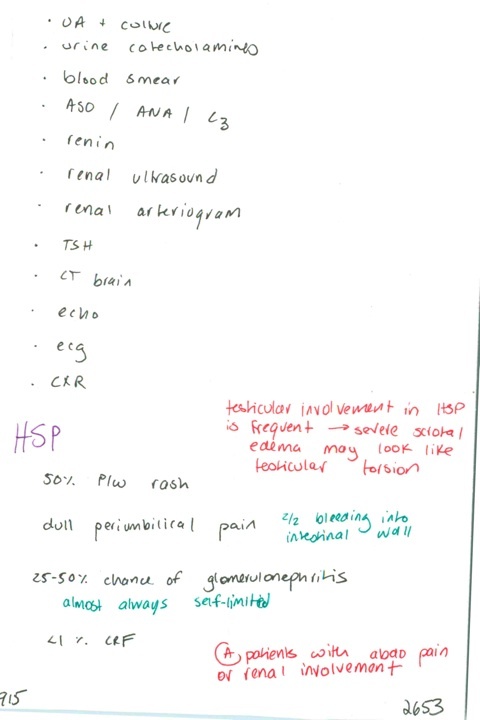 Keep SBP below 160 until clipped or vasospasm occurs. Use labetalol, nicardipine, or esmolol. Oral nimodipine is used for vasospasm prophylaxis, not treatment of hypertension, though it may lower blood pressure. Do not treat hypertension. Keep CPP between 50 and 70, but do not use vasopressors. Reduce by 20-30% if > 160/100 with IV/SL nitro or beta blocker. Treat hypertensive and normotensive pulmonary edema patients with IV/SL nitro or ACE inhibitor. Reduce MAP by 25% over eight hours with labetalol, nicardipine, or esmolol. Keep SBP < 160 and DBP < 110 if prepartum or intrapartum. Use 150/110 if postpartum or platelets < 100,000. 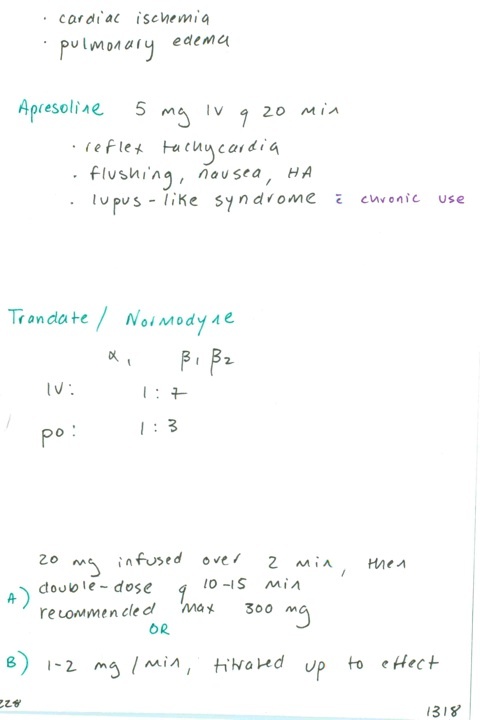 Use IV labetalol or hydralazine or oral nifedipine. 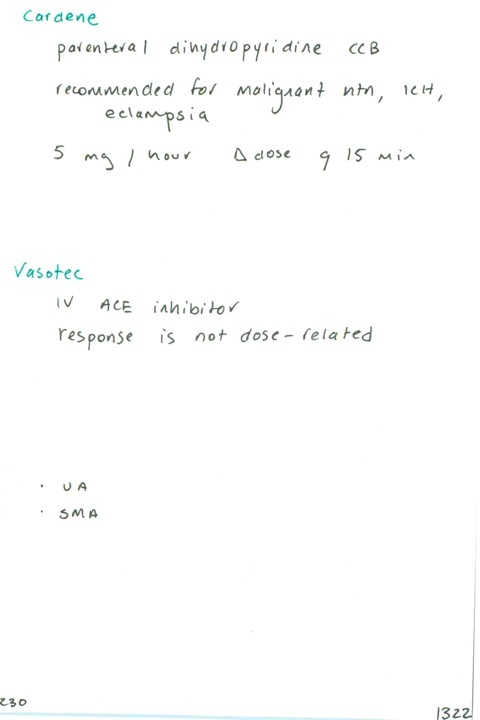 ACE inhibitors and esmolol are contraindicated. Treatment for eclampsia should also include magnesium, 6 g over 20 minutes, then 2 g per hour. Asymptomatic hypertension does not require treatment. If treatment is required, benzodiazepines are first-line therapy. If cocaine-related ACS, add nitroglycerine or IV phentolamine. 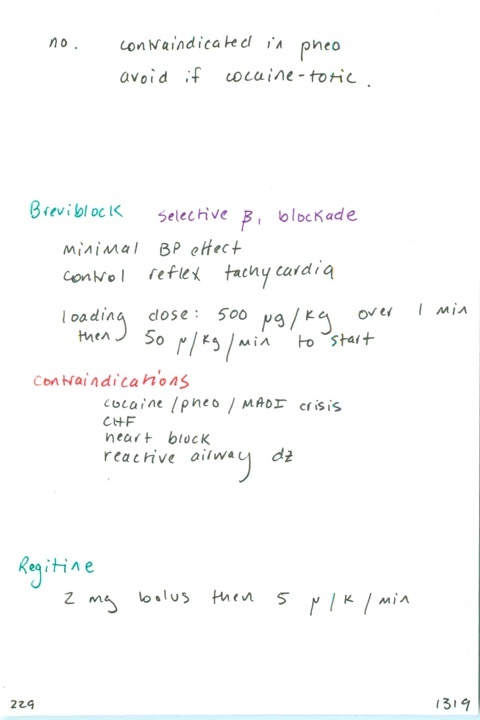 Avoid beta blockers, including labetalol.